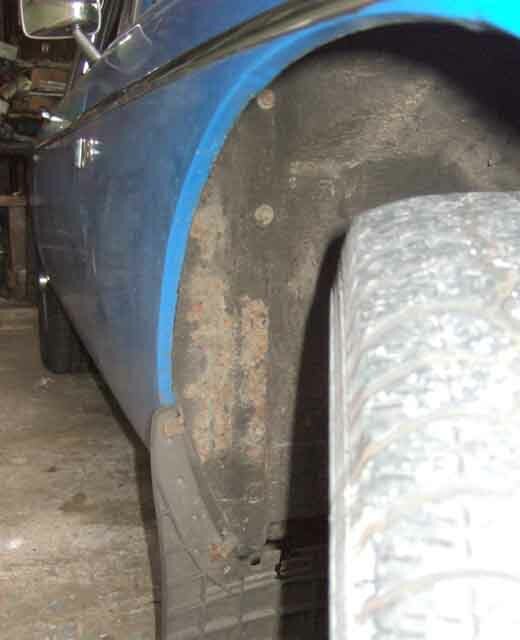 General view showing the location of the panel behind the front wheel. 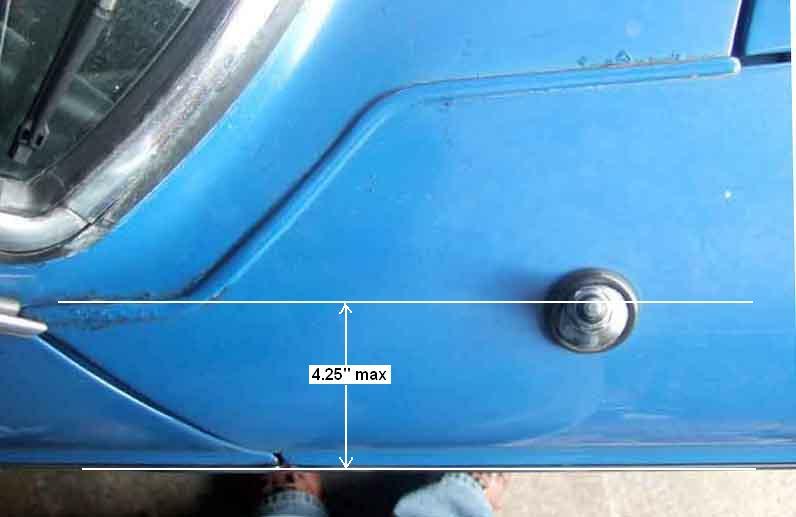 This is the right-hand side, where it seems common to mount the aerial on right-hand drive cars at least i.e. the drivers side, possibly to be clear of pedestrians when parked on the correct side of the road. 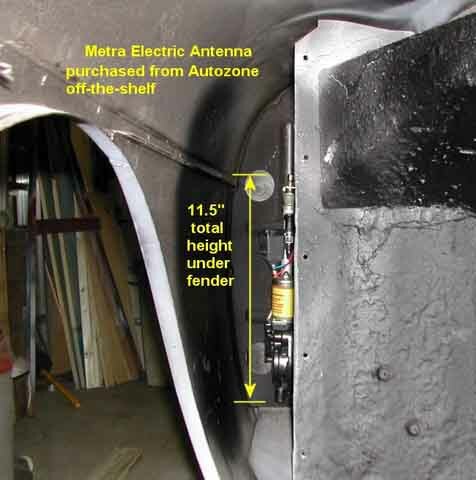 Normally it is recommended that the aerial be mounted on the opposite side to the ignition system to be as far away from interference as possible. However Clausager shows both right- and left-hand drive cars with some having it on the driver side and some on the passengers in both cases, so no consistency there. The top of the main splash panel with three bolts, with the smaller panel and seal just visible above the box-section at the top right. 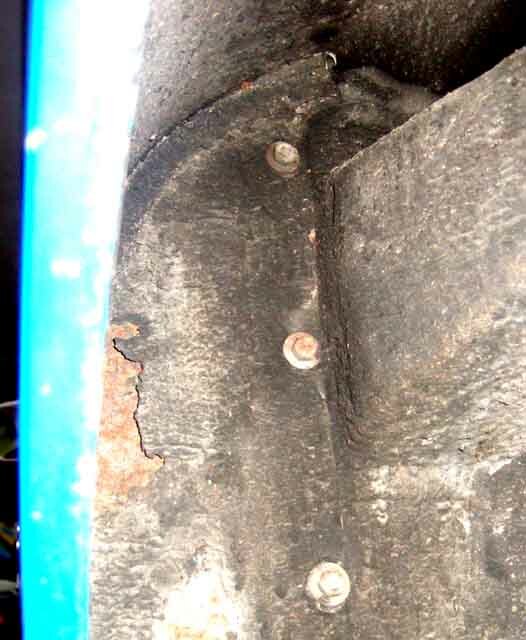 The bottom of the main splash panel with three bolts visible, the 4th bolt is out of sight where the very bottom of the panel turns under the sill. Showing the box and 'trumpet' section and how they relate to other parts of the structure. 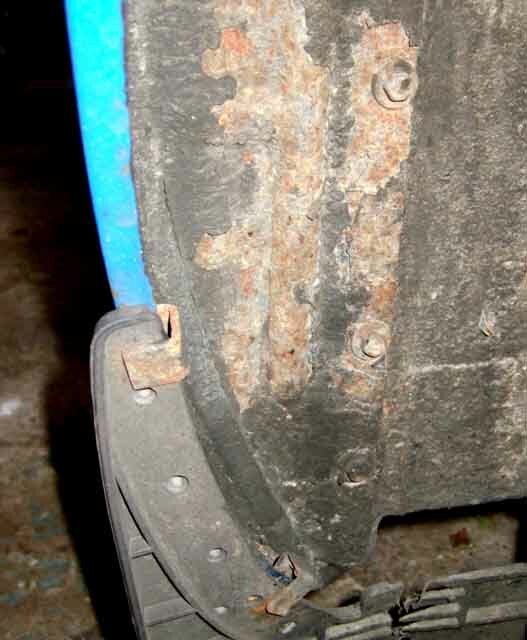 This picture starkly shows the rot that can develop, in this case on a roadster. 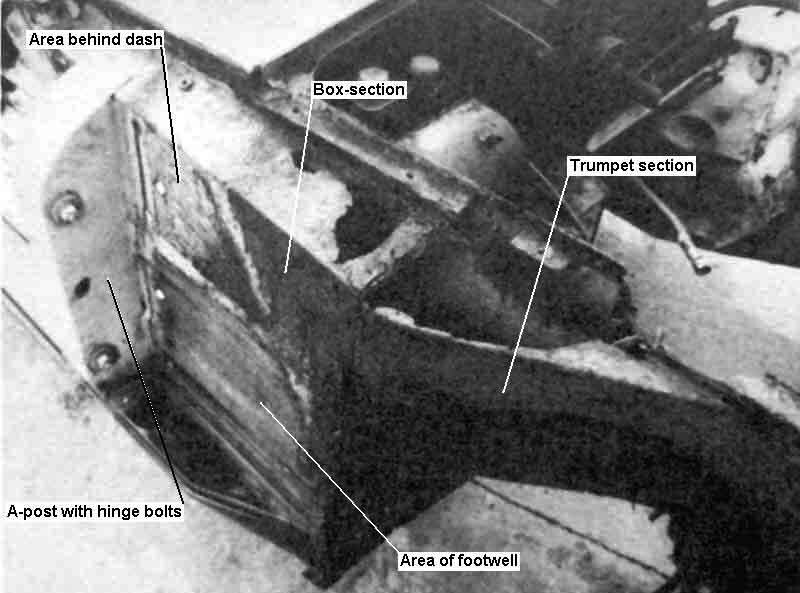 The top of the trumpet section (in front of the splash-panel) is the most prone as there as a flat 'shelf' that is a great receptacle for water, mud and salt thrown up from the wheels. 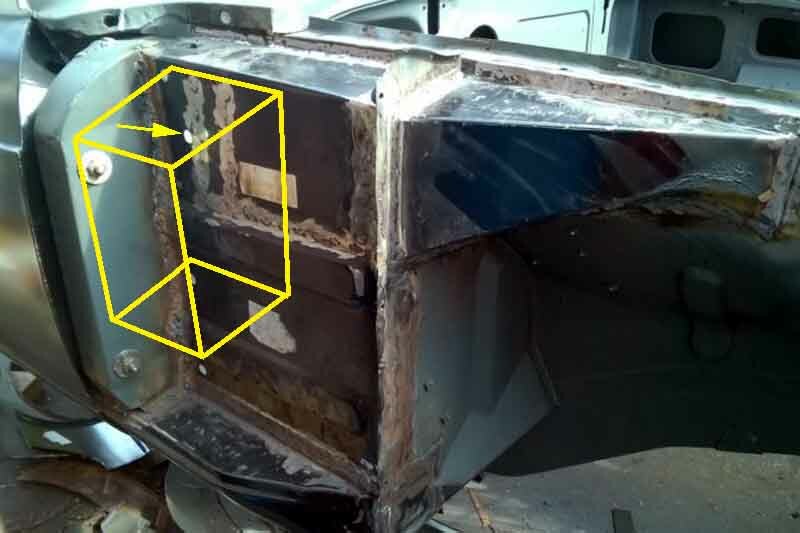 the top of the box section is protected by the splash-panel, but can still rot as shown here. 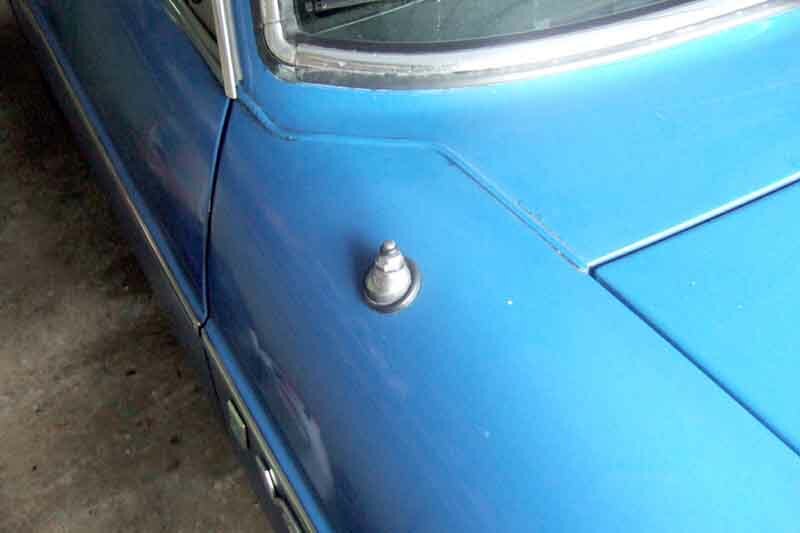 Lyndsay Porter's 'Guide to Purchase and Restoration of the MGB'. A general view of the position of a motorised aerial on my V8. As long as you keep within about 4.25" of the outer vertical face of the wing you should be able to clear the box-section. The fore-and-aft position is much less critical, but you must be far enough forward to clear the A-post. You will also need a hole to pass the cable through to the cabin. 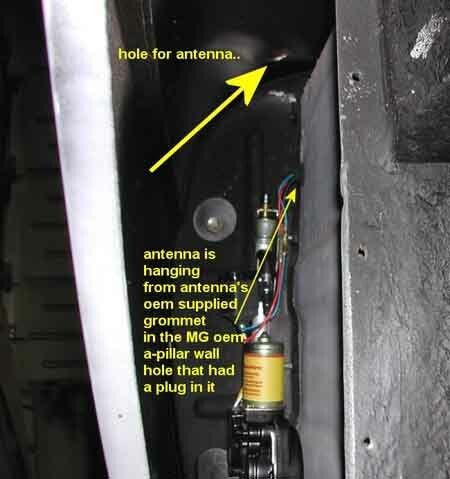 My car came with the aerial so I don't know exactly where one had to be drilled or not or exactly where it is, but both the Porter photos seem to show a hole just forward of the A-post, and Paul Tegler (see below) also found a factory hole, ready grommeted. Paul Tegler's motorised aerial in the process of being installed. In these photos the aerial is significantly below its final position, and shows just how much room there is to work with. The first photo also shows the 'shelf' which forms the top of the box section adjacent to the inner wing. If you drill the hole any further in towards the engine compartment than Paul has you run the risk of being above this shelf, and so having to drill through the top of the box section as well, and the bottom of the box section will severely limit how deep your aerial can be.